Growing canna from rhizomes is extremely easy. First of all you will need some rhizomes. There are a few on line suppliers and some nurseries sell a meagre selection. The image to the right is of a canna indica purpurea rhizome. As far as canna rhizomes go, they are quite bulky. The section of rhizome pictured weighs in at 365g, about 12 oz. 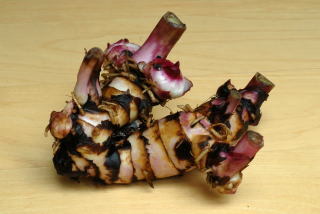 If you purchase canna rhizomes on line or from a catalogue you will get a section of rhizome. Different varieties have quite different sized rhizomes. It is best to pot these up immediately as they do not like drying out. Plant them horizontally, half way down, in a pot wider than the section of rhizome is long. 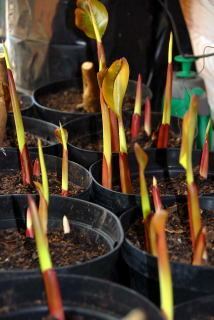 Some canna grow quite quickly and will soon be trying to get out of the pot if it is too small. The potting medium does not seem to bother the plants. I choose to use a peat free multi-purpose. This is partly an ethical decision and partly because the plants are quite happy. 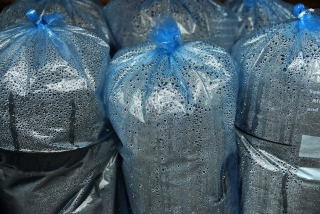 It is also easier to re-wet than traditional multi-purpose compost if the pots have dried out completely. Next water the pot thoroughly and allow it to drain. There are a couple of ways to get your rhizomes on the move. If you have a greenhouse with an electricity supply, heated mats are a very good option. The pots sit on a heated surface and will begin growing remarkably soon. 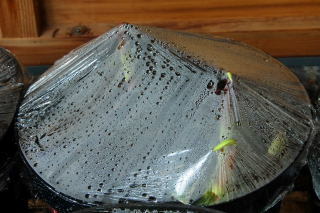 In this case cover the pots with cling film to prevent them drying out. Place your pots on the heated mat. Sit back, relax and soon you will be presented with keen young shoots. Indoors it is advisable to put the pot in a clear plastic bag and seal it. Water and furniture do not make ideal bed mates Forget about it for a week or two depending on how warm the room is. You will soon be presented with new shoots. Once shoots appear, remove the cling film. If you grew them in a bag, open the top. Then all you have to do is water as necessary and wait until it is safe to plant them in the garden. When this stage is reached, you will need to provide your plants with a nice rich soil. If cosseted your canna plants will grow taller faster and provide you with more flowers. Remember your canna plants only have one shot at the title. They often do not have the luxury of waiting a few years for the ideal conditions to come a long. Conventional hardy plants can afford to sit out the poor summers, they are in it for the long haul. Prepare the soil thoroughly. Dig in plenty of home made compost and composted farm manure. Do not panic, you can buy the composted or blended farm manure in a convenient sack form, from your local garden centre. If your soil is very poor, it will be necessary to do large scale soil preparation. This will be discussed at length else where on this site. (Eventually). When planting your canna plants, particularly if you have any kind of slope to your garden, plant your canna in craters. If you are planting individually a mini crater will do. A larger group can be planted in a communal crater. It is far easier to get the water to stay where it is needed. Then water thoroughly. If conditions are dry, water regularly to get your plants established. Relax and enjoy the summer.